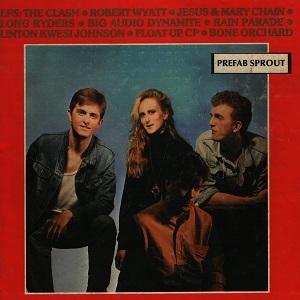 Prefab Sprout emerged from out of the UK New Wave scene in the 1980s. Their first album, crafted from complex chords and convoluted melodies was highly acclaimed, including by Elvis Costello and John Peel, reaching the top 20 in the UK. Each successive work has brought us closer to the pinnacle of perfection, placing before our ears melodies which are nostalgic yet highly sophisticated, and which bring to mind names like Steely Dan and Burt Bacharach. 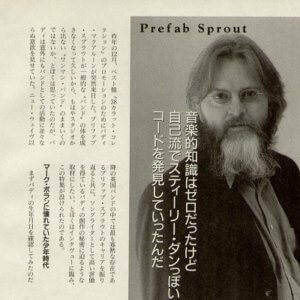 In this special feature, I will attempt to discover the secret of outstanding songwriting, based on an interview with Paddy McAloon, the central figure of the band, who came to Japan at the end of last year. Last December, Paddy McAloon unexpectedly came to Japan to promote the “best of” album, “38 Carat Collection”. I’d thought he was a one man band who would no longer come out from his studio, because Prefab Sprout has not been a real band for a long time. This is what I thought, but Paddy surprised us all. He showed an amazing motivation to return to activities as part of a band. 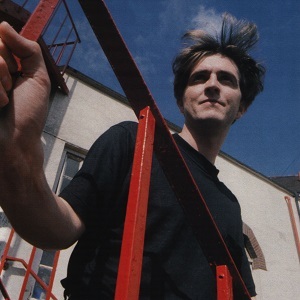 I wanted to look back on the career of Prefab Sprout, one of the most reclusive of the post New Wave British bands, and I wanted to discuss the secrets of Paddy’s creative process, which has earned him massive acclaim as a songwriter. This proposition was put to the interviewee, and a meeting was arranged. I started by trying to check Paddy’s date of birth, and found out that I had been mistaken in my belief that he had been born in 1960 as was reported up until now. I can’t pass over Paddy’s academic history: he went to a Catholic seminary. Not least because the elegance that fills his music and the religious aspects that infuse his lyrics seem to have been instilled in him during his school days. However because the UK educational system is completely different from Japan, it’s hard to get a real picture of student life. So I decided to ask him about his days in the seminary, looking back on high school education in the era in which he grew up. Why is there no tuition fee even though it is a private school? Many young peoples’ films in UK and Europe are set in schools where the discipline is quite brutal. What was the seminary like? “Although it was a boarding school, I moved to a private room when I was 14 or 15 years old. I was able to play guitar and I started writing songs. Because it was a seminary you can certainly say it was a special environment; although people say my records have strong religious imagery I don’t have a particularly strong faith. At the time I was a kid who was crazy about things like pop music and football. There was a private room in the dormitory where I was able to have piano lessons, and I sneaked my mother’s guitar into my luggage and brought it to the dormitory and played there. There was a member of staff in the dormitory, about 21 years of age, Jim O’Keefe, now a priest, who played the guitar so I launched myself at him and asked him questions. There were five or six students who had a guitar, but I was the most disappointed of all of them when he didn’t answer my questions. I recalled that I’d heard that Lindisfarne came from Newcastle. 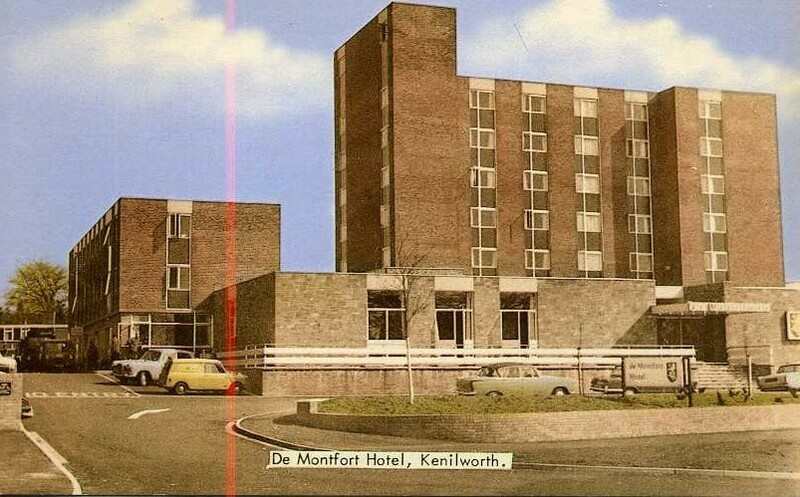 A long while back they had some UK hits, like “Lady Eleanor” or “Meet Me On the Corner”, and after that worked as an excellent folk rock band with a strong local flavour. The main songwriter, Alan Hull, has already passed away, but he was an excellent songwriter in the Lennon & McCartney vein, with a great pop sensibility in his solo work. Paddy often cites Marc Bolan as being his idol as a young boy, but there was no reason not to also be influenced by the local band, Lindisfarne. I wondered how he regarded Alan Hull who was very similar in many respects as a songwriter. The common factor between Paddy and Alan Hull is that both scatter beautiful melodies into the instrumental parts, that in other music is more usually driven along by a beat, and the creation of a beautiful piece of music is never something they are ashamed of. Even though the songs are mellow and with authentic melodies, by dint of elegance and an ambition to be enduring they avoid kitsch. Although the songs from Prefab Sprout albums do seem to enter the top 20 when released as singles, the best songs don’t ever seem to reach the top of the UK charts. In the particular aesthetic appeal they have, I perceive a distinctive flavour not found in Liverpool or Manchester bands for example. Paddy had decided to create a band called Prefab Sprout before he started full-scale musical activity. In fact it was a long time before be started music. What was it like to be a Prefabricated Sprout in his fantasies? But it’s an interesting episode. On the eve of the interview I re-listened to all Prefab Sprout’s albums and I felt that here was a man who is making music to paint a picture. I can easily imagine the picture of a boy who was involved in making his tapes, and this honest passion of wanting to make music has remained constant to this day. In fact you were a band based on original songs right from the beginning, but usually young peoples’ bands start by copying someone else. Did you cover any songs that might indicate Prefab Sprout’s roots? “I don’t remember the band copying anything – actually I recorded a Jim Reeves song later – because no one was able to play well enough to copy anything. But when I was writing a song I was convinced I was Marc Bolan. . Of course, I did some other songs, and I still have the tapes of those days, but when I listen to them it’s strange that they sound like nothing more than a very early Prefab Sprout. “In 1977 we didn’t like New Wave. I liked Steely Dan and David Bowie. My musical knowledge was zero but my interests were refined. ‘Steve McQueen’ is an album from 1985 but we were playing most of the songs, like ‘Bonnie’ and ‘Johnny Johnny’ in ’77. In August 1982, Prefab Sprout released “Lions In My Own Garden” on the independent “Candle Records” label. 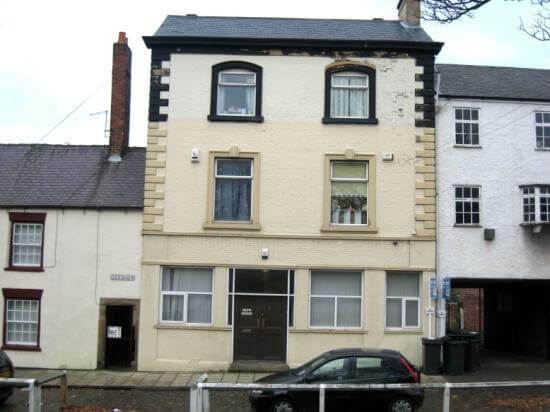 This caught the attention of Keith Armstrong, manager of the biggest indie label in Newcastle, Kitchenware records, who had a unique strategy of signing distribution contracts with major labels for each group. The following year, 1983, “Lions” was re-released on Kitchenware, then Prefab Sprout, now including Wendy Smith, released their second single, “The Devil Has All the Best Tunes” and started working on their first album, “Swoon”. At this time Michael Salmon withdrew from the band and responsibility for the drums was passed to the supporting musician Graham Lant. After hearing Prefab on DJ John Peel’s show, Elvis Costello chose the band to be the opening act on his Christmas tour. And Costello did the band the honour of covering “Cruel”. Kitchenware were successful in selling Prefab Sprout to CBS. Swoon was released in March 1984, and the album entered the UK top 20. I bought it at the time it went on sale, but although there were some good songs I didn’t find it was completely convincing album. New Wave had completely settled down, and a bunch of neo-acoustic bands who were placing pop melodies and refreshing sounds into the foreground came out into centre stage on the scene, but I didn’t think that Prefab Sprout were particularly amazing. Many of the songs, in trying to use sophisticated chords, distorted the melody, and Paddy’s vocals were poor at times. It was the kind of thing that’s often heard in this stage of a band’s development, but it was also obvious that there was something unique that wasn’t found in other bands at the time. So I bought “Steve McQueen” soon after it was released in June 1985. The jacket that recalled the title and a scene in the move “The Great Escape” was wonderful and very cool, and it was easy to perceive that the sound had changed drastically. The critical point was the arrival of Thomas Dolby as producer. It was clear that Paddy was very influenced by Steely Dan, but Dolby’s production which introduced more space succeeded in blending Steely Dan’s cool texture with Newcastle’s neo-acoustic band. But what was more surprising was Paddy’s growth as a songwriter. Having a settled drummer in Neil Conti was another reason for the success of the album, but the song-writing was a determining factor. 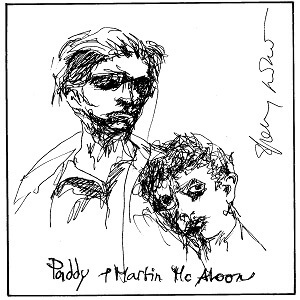 Since this album, Paddy has become in my estimation one of the most notable song-writers. Steely Dan is a group that makes great sounds, but they make that sound by gathering together leading session musicians. You can make music like that if you have good musicians and musical knowledge, which obviously wasn’t the case with Prefab Sprout. 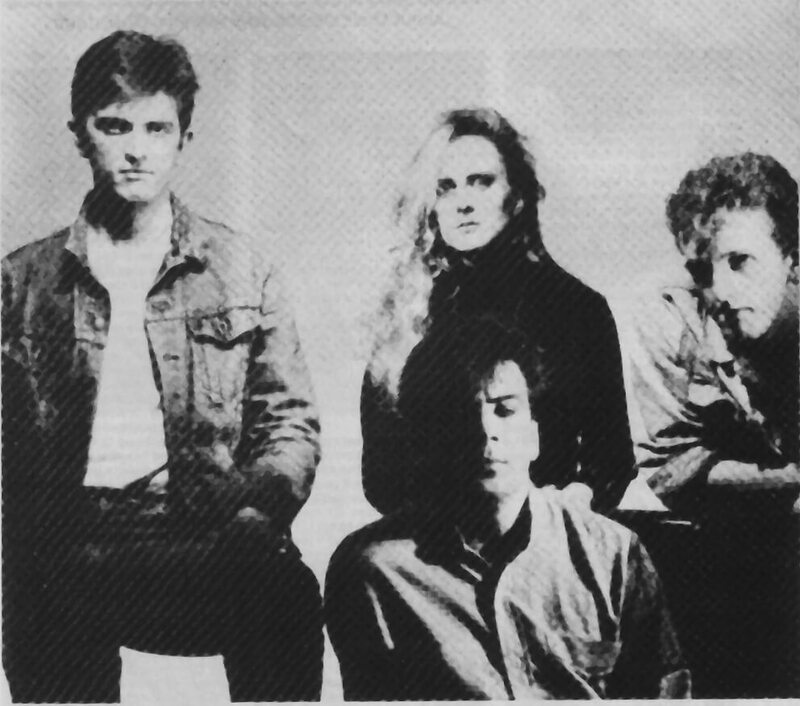 Prefab Sprout recorded an album that would later be released as “Protest Songs” in the course of just two weeks immediately following the release of “Steve McQueen” with Thomas Dolby’s distinctive sound. What are Paddy’s thoughts about this album, which was also said to have been a reaction to that production style? “From Langley Park to Memphis”, released in March, 1988, would become their first album to enter the top five of the UK Albums Chart. It is a work where Paddy’s richness as a songwriter, which can be seen to have taken the opportunity of “Steve McQueen” to begin aiming for mainstream pop, becomes assured. However, beyond the sophisticated pop sounds of the finest quality, a rugged, rocky surface can also be seen through a shroud of mist. It is from here on that Prefab, which has firmly remained in an area of “rock” on the verge of becoming soft, becomes the only one of its kind. “‘King of Rock ‘n’ Roll’ and ‘Cars and Girls’ are two songs I wrote immediately after ‘Steve McQueen’. ‘Steve McQueen’ is a wonderful work, but when I listen to it now it seems very serious. I wrote ‘King of Rock ‘n’ Roll’ in five minutes because I wanted to do a fun song, and ‘Cars and Girls’ was written as a pastiche of Bruce Springsteen. I thought I’d like to do a whole album like those two songs. I’d spent three months with Thomas Dolby and I was familiar with his approach, so when I began working on new songs I also found it natural that ‘Thomas will do this’. There’s no doubt that “Jordan: the Comeback”, released in August 1990, is Prefab Sprout’s masterpiece. Just like “Steve McQueen”, “Bonny”, “Nancy” and so on that have appeared so far, there are a lot of proper names in this album. It uses the names of individuals symbolically and the work gains real depth from the world view such associations bring. Following the conclusion of the 1990 tour that took place in conjunction with the release of “Jordan”, Prefab Sprout stopped playing live. After that Paddy continued to make songs in the studio, just as Brian Wilson had. In May 1997, when “Andromeda Heights” was released as the first album for seven years, I reviewed it in a magazine as “A very good album, but maybe a little over-worked. Is Paddy (in a bad way) wanting to become Brian?”. Because Paddy used the name of his newly constructed studio as the album title, and because there was more of a hint of a secret room or magic garden about it, to be perfectly honest, I wasn’t all that impressed with the quality of the sound. In Spring this year, Prefab Sprout will play their first British gigs for nearly 10 years. Is the reason that Paddy is resuming live activity – which he himself says is not his forte – perhaps because he wants to play in a band again, to regain the energy and wildness he remarks on in this interview? I can foresee the day when an album even better than “Jordan: the Comeback” is coming closer.